Our Quick cups allow you to convert most HVLP turbine 1 qt. siphon spray guns with a 3/8 in. gun to cup fitting to a smaller and easier to maneuver 8 oz. cup. 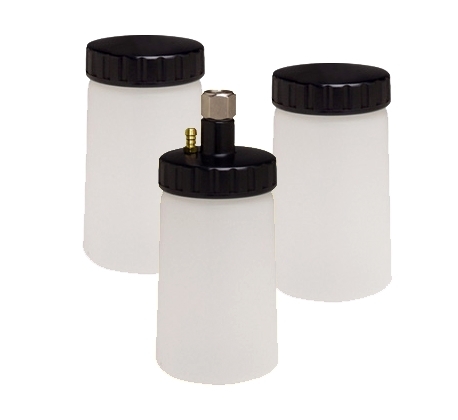 Quick cups allow the spray gun to fit in smaller spaces and are perfect for small projects or touch-ups! Master lid w/ 3/8 in. gun to cup fitting and pressure tube connection. I purchased these cups for my RS1 spray gun because I shoot lacquer and when I do I only shoot 6 or less ounces and the cups work great for the small size. It also comes with airtight kids so you can store the finish in the cup. Quality product! For the price good product. Helps when spraying samples.